We have featured so many beautiful craft spaces on Everything Etsy, but there is always a new one that just make me want to move in. 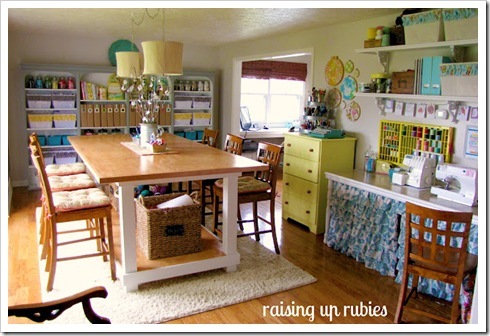 This fabulous craft room that belongs to Raising Up Rubies is outstanding in every single way possible. No details are left undone! Do you want to move next to Jamie now and bake her cookies so you can play in her craft room? 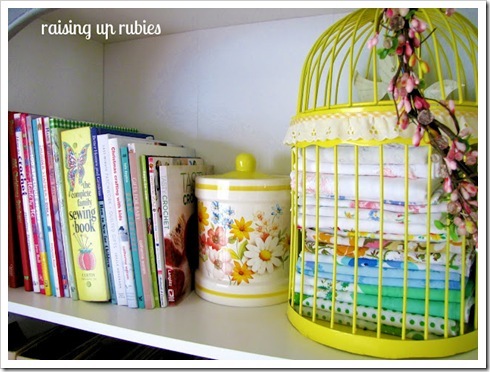 Vintage pillowcases in a yellow bird cage…just beautiful! Wow, wow, and wow! I’m so jealous of the typewriter because I’ve been wanting one for awhile…in that color. The embroidery hoops with vintage fabric are perfect! Markers & such are displayed beautifully and ready to use. 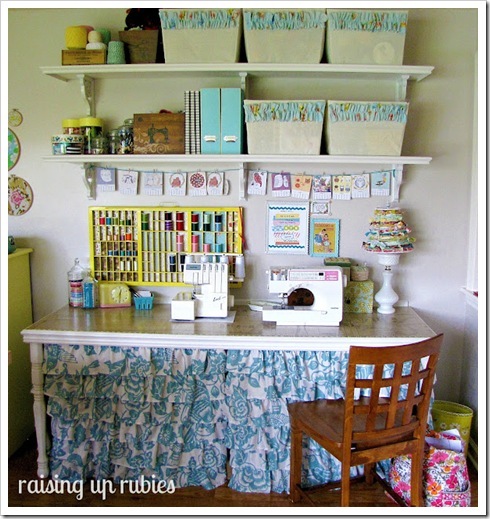 I love, love, love all the ruffles here and just wait until you see how Jamie finished the top of her sewing table. You’ll need to visit Raising Up Rubies to see this cool idea! There are so many details that you NEED to see! Trust me on this! Visit Raising Up Rubies right now. 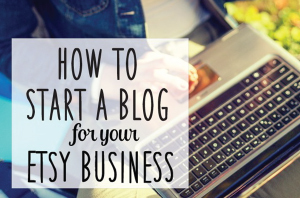 It will put you in a crafty good mood for sure! 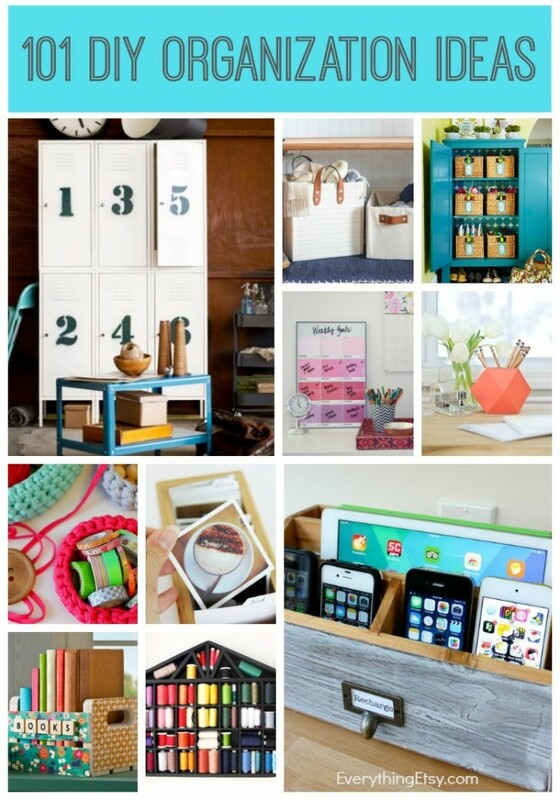 Looking for more craft space inspiration? 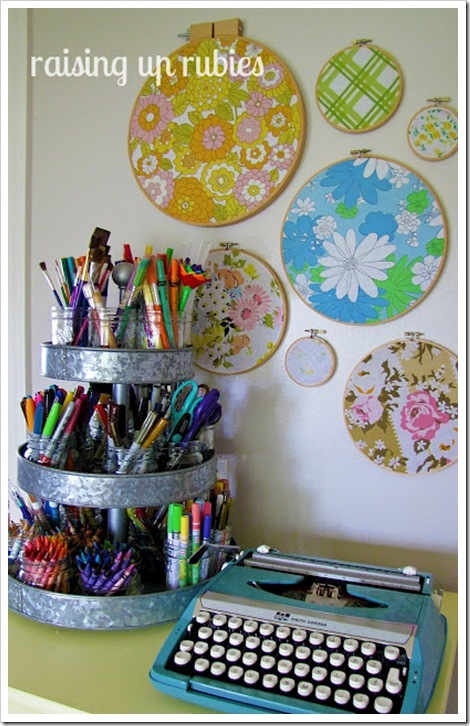 Click here for tons of organization ideas for your crafts supplies and just plain pretty craft studios you’ll love! 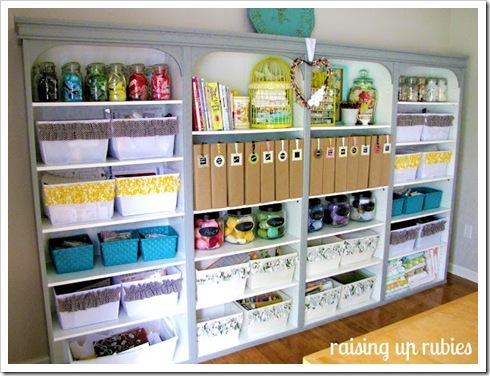 Wow this is an amazing craft room! It must have taken so long to organize!! Tons of inspiring ideas thanks! Amazing! Love it all — but my favorite would have to be the huge cutting table / gathering space in the middle of the room with those huge baskets underneath for storage of bulky items. Also love the rainbow-ordered glass jars full of notions and the incredible laminated sewing machine table top with built-in tape measure. How handy! This is so, so beautiful!! I’m green with envy. Wow! 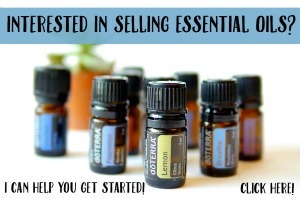 Wow ladies…what a privilege to be featured here! Thank you all for the sweetness & I’m so glad you like my little space! Wow! I am organized but, I have to redo my room and add beauty to the organization. It really is a beautiful room! I think I’m going to faint! I am jealous – what a fabulous environment for creations. I saw you room in the BHG magazine too. Where did you get those grey bookcases? The magazine said they were inexpensive, put-them-together cases.